1 Feral set,WoW 1 Guardian set,WoW 1 Restoration set,WoW and 1 Balance set of item level 566, with all pieces dropping from bosses in the Mythic version of Siege of Orgrimmar. The Normal and Heroic sets look exactly the same. 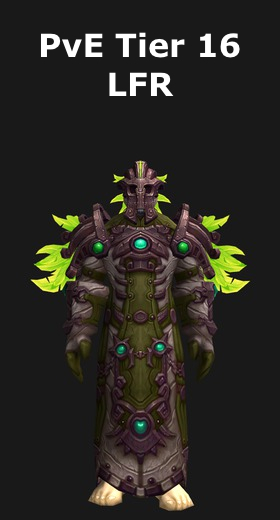 The Tier 16 LFR sets are bought from Lorry Warmheart (at the Shrine of Seven Stars) and from Tu'aho Pathcutter (at the Shrine of Two Moons) with tokens that drop from bosses in the LFR version of Siege of Orgrimmar. Note that LFR tokens can be bought from the same vendor using Essence of the Cursed Vanquisher, which can drop from Garrosh Hellscream in LFR difficulty. 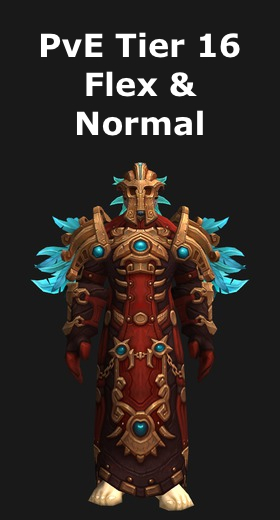 The Tier 16 Normal sets are bought from Lorry Warmheart (at the Shrine of Seven Stars) and from Tu'aho Pathcutter (at the Shrine of Two Moons) with tokens that drop from bosses in the Normal version of Siege of Orgrimmar. Note that Normal tokens can be bought from the same vendor using Essence of the Cursed Vanquisher, which can drop from Garrosh Hellscream in Normal difficulty. The Tier 16 Heroic sets are bought from Lorry Warmheart (at the Shrine of Seven Stars) and from Tu'aho Pathcutter (at the Shrine of Two Moons) with tokens that drop from bosses in the Heroic version of Siege of Orgrimmar. Note that Heroic tokens can be bought from the same vendor using Essence of the Cursed Vanquisher, which can drop from Garrosh Hellscream in Heroic difficulty. 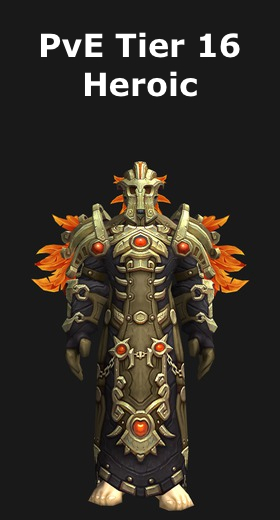 The Tier 16 Mythic sets are bought from Lorry Warmheart (at the Shrine of Seven Stars) and from Tu'aho Pathcutter (at the Shrine of Two Moons) with tokens that drop from bosses in the Mythic version of Siege of Orgrimmar. Note that Mythic tokens can be bought from the same vendor using Essence of the Cursed Vanquisher, which can drop from Garrosh Hellscream in Mythic difficulty.